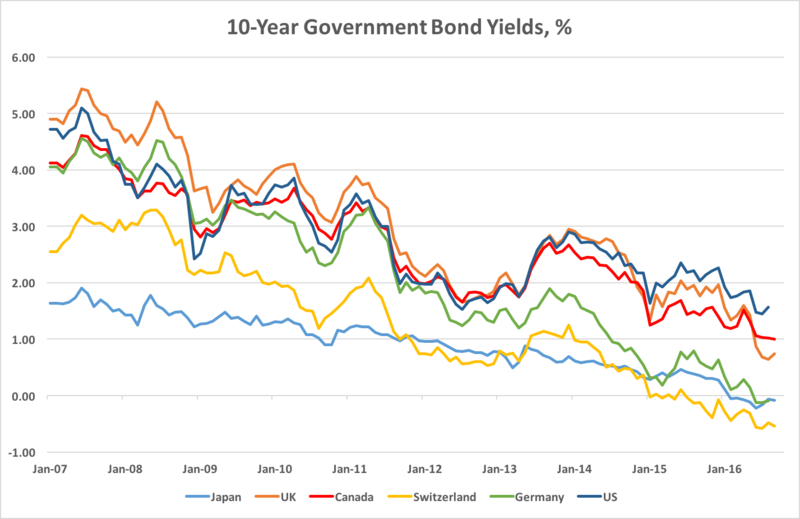 In a recent post, I discussed The Breakdown of Faith in Unconventional Monetary Policy. Zero interest rate policy (ZIRP), quantitative easing (QE), forward guidance on policy rates and, more recently, negative interest rate policy (NIRP) have been undertaken in various forms and to varying degrees by the four major DM central banks, the US Federal Reserve (Fed), the European Central Bank (ECB), the Bank of Japan (BoJ) and the Bank of England (BoE). Some smaller central banks have dabbled in unconventional monetary policies (UMPs), including the Swiss, Danish and Swedish central banks. But, from the perspective of other countries, where the domestic central banks have not been aggressive participants in UMP, the important question is how do these policies affect their economies, their financial markets and the independence of their monetary policies. Recent research has focused on the global spillovers from UMPs of the major central banks into the monetary policies and financial conditions of other global economies, especially EM economies and some of the small open DM economies. This research has found strong evidence that UMP has spilled over into other economies, complicating the conduct of national monetary policies and, at times, creating risks to financial stability. We find economically and statistically significant spillovers from the United States to EMEs [emerging market economies] and smaller advanced economies [including Canada]. 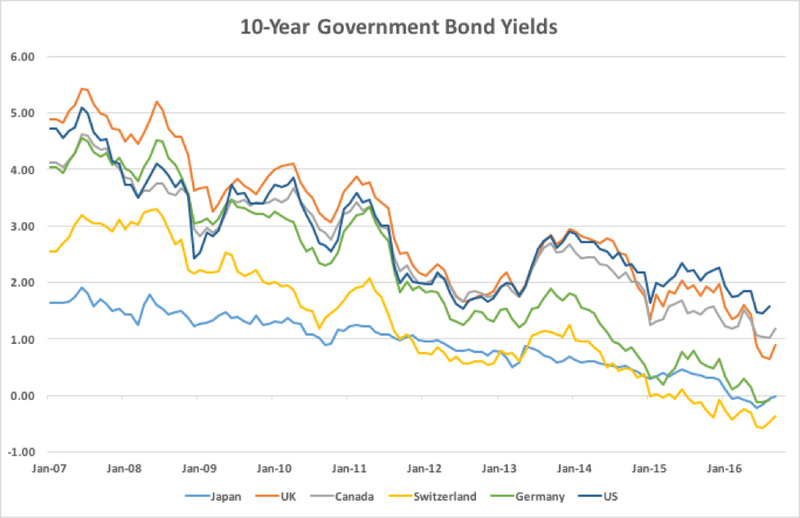 These spillovers are present not only in short- and long-term interest rates but also in policy rates. In other words, we find that interest rates in the United States affect interest rates elsewhere beyond what similarities in business cycles or global risk factors would justify. We also find that monetary spillovers take place under both fixed and floating exchange rate regimes. Most central banks target domestic inflation and let their currencies float, or follow policies consistent with managed or fixed exchange rates in line with domestic policy goals. Most central banks interpret their mandate exclusively in domestic terms. … [L]iquidity conditions often spill over across borders and can amplify domestic imbalances to the point of instability. In other words, the international monetary and financial system as we know it today not only does not constrain the build-up of financial imbalances, it also does not make it easy for national authorities to see these imbalances coming. Moreover, the search for a framework that can satisfactorily integrate the links between financial stability and monetary policy is still work in progress with some way to go. The development and adoption of such a framework represent one of the most significant and difficult challenges for the central bank community over the next few years. through the availability of external finance in general, regardless of currency: capital flows provide a source of funding that can amplify domestic credit booms and busts. In the run-up to the global financial crisis, for instance, cross-border bank lending contributed to raising credit-to-GDP ratios in a number of economies. Through these channels, monetary and financial regimes can interact with and reinforce each other, sometimes amplifying domestic imbalances to the point of instability. Global liquidity surges and collapses as a result. What I have just described is the spillovers and feedbacks – and the tendency to create a global easing bias – with monetary accommodation at the centre. But these channels can also work in the opposite direction, amplifying financial tightening when policy rates in the centre begin to rise, or even seem ready to rise – as suggested by the taper tantrum of 2013. For smaller, open DM economies like Canada, the spillovers from the major central banks’ UMPs are readily visible. When the major central banks lowered their policy rates to near zero, the Bank of Canada (BoC) did likewise. This was partly driven by concerns about domestic economic weakness and partly to resist appreciation of the Canadian dollar and the resulting loss of competitiveness. When the BoC became concerned about what proved to be a temporary increase in inflation and raised its policy rate in 2011, the Canadian dollar appreciated strongly. When major central banks engaged in Quantitative Easing, through large-scale purchases of their own sovereign debt, demand for close substitutes like Canadian sovereign debt increased and forced down Canadian long term government bond yields. When major central banks, including the Bank of Japan, ECB and BoE moved to NIRP, the Bank of Canada announced that its research showed that it, too, could lower its policy rate below zero if necessary. The net result is that Bank of Canada policy has become both constrained by and heavily influenced by the UMPs of the major central banks. Canadian liquidity and financial conditions reflect not just the BoC’s policy rate setting, but also and more importantly, the extraordinarily accommodative policies of the major central banks. The BoC has had no choice but to keep its policy rate low. Failing to do so would have created even greater exchange rate appreciation that would have stunted growth even more and pushed inflation even further below the 2% target. The ultra-low interest rates imported through global financial markets, have led to a credit boom. The credit boom has been characterized by heavy borrowing by Canadian households and some sectors of Canadian business, such as the energy sector. The heavy mortgage borrowing by households has contributed to overheated housing markets in Vancouver and Toronto. As I have argued in a previous post, the housing boom in these cities was amplified by easy credit policy by the People's Bank of China (PBoC), which saw synchronized housing price surges in large Chinese and Canadian cities. With inflation below target and the BoC unable to raise its policy rate to quell this overheating, federal, provincial and municipal governments have intervened with macro-prudential policies, such as tighter mortgage rules, the recent tax on foreign homebuyers in Vancouver, and the federal government's closing of the capital gains tax loophole for foreign homebuyers. When energy prices were high, supported by near-zero policy rates and the liquidity boost provided by quantitative easing by the major central banks, Canadian energy companies issued large amounts of corporate debt at low rates. When the surge in global investment in fracking technology spurred strong growth in energy supply at a time of lacklustre demand growth, energy prices collapsed and default rates jumped sharply in the energy sector. The integration of global financial markets means that global uncertainty and risk aversion is instantly transmitted to Canadian markets for stocks and bonds. Canadian markets and asset prices are now as sensitive, if not more sensitive, to changes in policies of the major central banks as they are to changes in Bank of Canada policy. This raises the important question of whether the central banks of smaller open economies, like Canada, can pursue independent monetary policy. Mundell proposed the concept of the "impossible trinity"; free capital movement, a fixed exchange rate, and an effective monetary policy. The point is that you can't have it all: A country must pick two out of three. It can fix its exchange rate without emasculating its central bank, but only by maintaining controls on capital flows (like China today); it can leave capital movement free but retain monetary autonomy, but only by letting the exchange rate fluctuate (like Britain--or Canada); or it can choose to leave capital free and stabilize the currency, but only by abandoning any ability to adjust interest rates to fight inflation or recession. 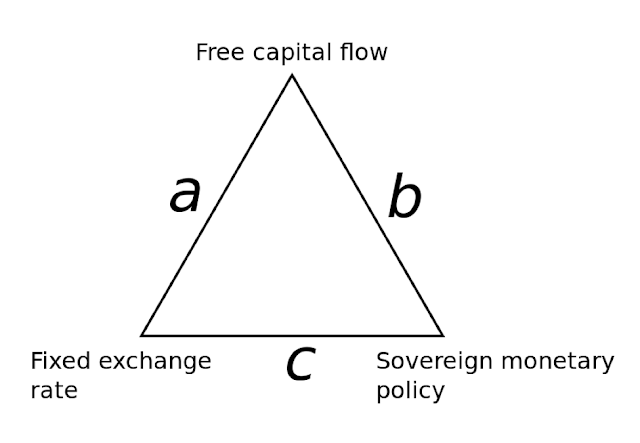 Wikipedia summarizes with the help of the diagram below: "The Impossible Trinity" or "The Trilemma", in which two policy positions are possible. If a nation were to adopt position a, for example, then it would maintain a fixed exchange rate and allow free capital flows, the consequence of which would be loss of monetary sovereignty. When Canada let its exchange rate float in 1970, it opted for position b on the chart, accepting the need for a flexible exchange rate because it wanted to maintain free international capital mobility and a sovereign (i.e., independent) monetary policy. But global monetary policy spillovers now challenge the ability of smaller central banks to conduct an independent monetary policy, even if the central bank is prepared to maintain a flexible, market-determined exchange rate. [M]onetary policy [of] the center country [i.e. the major central banks] … affects leverage of global banks, credit flows and credit growth in the international financial system. 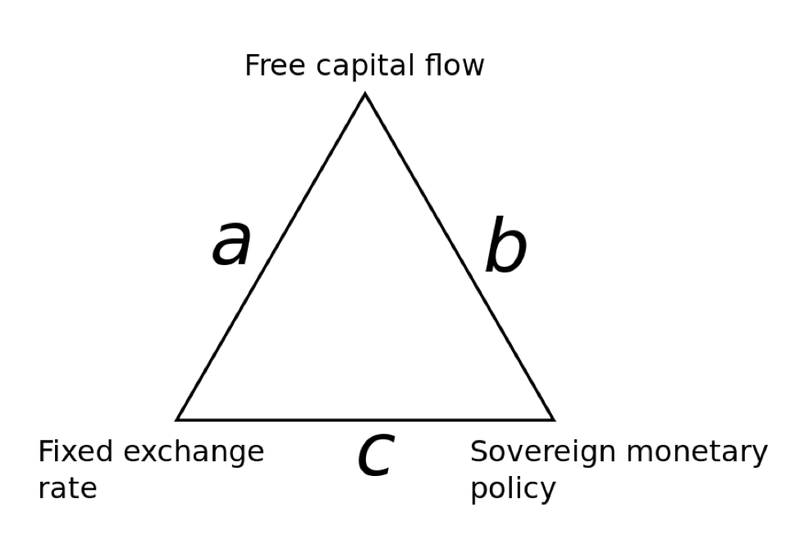 This channel invalidates the "trilemma", which postulates that in a world of free capital mobility, independent monetary policies are feasible if and only if exchange rates are floating. Instead, while it is certainly true that countries with fixed exchange rates cannot have independent monetary policies in a world of free capital mobility, my analysis suggests that cross-border flows and leverage of global institutions transmit monetary conditions globally, even under floating exchange-rate regimes. At a minimum, it is high time that the Bank of Canada openly analyze and discuss with the public, the influence that the major central banks' unconventional monetary policies are having on the Canadian economy and financial markets. How will the future paths of the major central banks policies influence and constrain the policies of the Bank of Canada? With the Fed signalling that it plans to resume a gradual tightening of policy at a time when the Canadian economy is struggling to adjust to much lower prices for oil and other commodities, the likely spillover will be a premature and possibly excessive, tightening of Canadian financial conditions. Should the Bank of Canada keep pace with Fed tightening or hold the line on Canada’s policy rate and thereby encourage further depreciation of the Canadian dollar? Or should it cut its own policy rate to offset the spillover of tighter financial conditions arising from Fed tightening? If Fed tightening pushes up global bond yields (and therefore Canadian mortgage rates) how should the BoC respond to the likely fallout in the Canadian housing market if housing prices experience a sharp correction? If US and global growth falters and the Fed returns to more aggressive use of UMP, including a zero or even negative Fed policy rate and a resumption of QE, can the BoC afford not to follow? If the BoJ and/or the ECB push policy rates further into negative territory, should the Bank of Canada be prepared to follow? If Japan adopts ‘helicopter money’ or central bank financed fiscal stimulus, should the BoC consider the same direction? Is there any alternative to mimicking the unconventional policies of the major foreign central banks? If the answer is yes, then how will the tradeoffs between the interests of savers and borrowers and between the interests of exporters and domestic consumers be balanced? If the answer is no, then what remains of the independence of the BoC? If its' policy rate and Canadian bond yields reflect spillovers from foreign central bank UMPs can the BoC independently pursue its' 2% inflation target? Are its policies not then dominated by foreign central bank actions or possibly by its own government’s needs to finance new spending and hold down debt service costs through financial repression? These are tough and important questions that are not even being discussed in Canada. You are right. Globalization has made financial flows much more integrated, just as trade and supply chains have become more integrated. Monetary policy in a small open economy doesn't seem to have built the models for this more complex system. Thank you for making these lucid observations on a labrynthine topic, and getting the dialogue started.